1. how to improve career guidance practitioners skills at European level? 2. how to build confidence in the consumers (i.e. users) of career guidance services? 3. how to facilitate mobility of career guidance practitioners between different European countries? A solution to the 3 main questions is, as suggested by the Cedefop tender, to develop a framework at European level to accredit people delivering career guidance. When doing this we face several main dilemmas I am going to discuss here. • Career guidance = career support = the help provided to individuals in planning and managing their careers (note 2). Includes activities such as informing, advising, using counselling skills, supporting, etc., related to career. • Competency (plural competencies): personal attribute (motive, trait, skill, aspect of one’s self image or social role, or a body of knowledge, etc.) causally related to effective or superior performance in a job (Boyatzis 1982). Other definition: Competencies: the human factors by which competence depends (Evangelista 2008). • To assess: to judge or decide the amount, value, quality or importance of something. D. areas of activity as in EVGP Educational and Vocational Guidance Practitioner, the framework recently developed by IAEVG (see Evangelista 2011). Occupational titles identify and refer only to people that carry out an activity as their main occupation. A framework accrediting occupational titles will so exclude all the people whose primary occupation is not career guidance. If we want to build confidence in the consumer our framework should include all the people that deliver career guidance, whatever their occupational title. An additional difficulty with A is occupational titles in career guidance vary widely in Europe and often there is not agreement even inside the same country. Solution A would so require to describe and compare each existing title in every EU country, not an easy task. So we exclude solution A. Option B: a task is a typically defined as a unit of specific work, that is, a set of activities needed to produce some result in a specific job, e.g., to write in a form the information collected during an interview. A main task can be defined as (Evangelista 2007): each main identifiable and self standing activity a competent career guidance practitioner can accomplish. So a task can be defined as a main task when is A. identifiable, B. self standing C. prominent D. requires significant distinct knowledge and skills to be carried out. To write in a form the information collected during an interview is not a main task, while deliver information related to career guidance as a separate activity face to face on 1:1 base does. To me this is the best option when dealing with services delivered by ‘a diversity of actors whose primary occupation is not career guidance’ because it allows to accredit exactly the main task(s) the practitioner performs. Task based options have also the important advantage to be more easily linked to the career guidance delivery process, and, this way, to more effective mapping of processes and training of personnel. For a list of main tasks, see below. This option has been adopted on the Project EAS quod on note 1. Option C: here we accredit a level of competence, as in UK’s NVQ system (note 3). The practitioner is assessed on a list of tasks (some mandatory, others optional), and then declared qualified at level 2, 3 or 4 in a precise area of NVQ (for example advice and guidance, personnel, counselling). This is more inaccurate on respect of a framework that accredits main tasks. Option D: EVGP accredits 10 areas of activity: assessment, educational guidance, career development, counselling, etc. This too can be less accurate of option B because some of the EVGP areas can be carried out at a different level of complexity and expertise. For example assessment includes the quite simple assessment of the needs of the client, usually carried out with a short interview, and the assessment of client’s potentialities, often carried out with complex psychometric tests. This can result in accrediting for the same area at the same level (only one level is provided) practitioners able to perform tasks of different levels or only the one able to carry out the more complex. Both solutions are unsatisfactory: the first creates confusion in the consumer, the second keep out from the accreditation practitioners carrying out basic career guidance tasks. 4. Main dilemma 2: to differentiate for clients typology or not? • Lifelong learning policies and work instability bring in the same location people needing different career guidance services. For example in many European countries young people and adults may attend the same college. 5. Main dilemma 3: What to assess in the framework? There are several approaches to assure competence of people at work (amongst them career guidance practitioners). Solution A has been used for several medical professions (note 5), but it’s questionable it could be for career guidance, because it requires the formal agreement of all EU countries. Solution B was initially adopted for vocational training qualifications (219 vocational training qualifications in 19 sectors were compared), but then it has been abandoned because too cumbersome. Solution C (use of EQF) has several pitfalls will be discussed in detail later. Even if the problems highlighted above could be solved, this option remain questionable because the correlation between educational or vocational qualifications and performance in career guidance main tasks may be feeble. A possible solution is to accredit practitioners that can demonstrate a prescribed set of personal qualities. When we examine a person who is working, we see personal attributes (knowledge, skills, attitudes, etc.) determine the performance on tasks to be carried out. The reasoning on which this option is based is ‘If you are precise, well organized, emphatic, (left side of the table below, note 6)………. than you will perform well the main task(s) on which you are seeking accreditation’. This can be called ‘The competencies approach to competence’ (if not clear, please go back to definitions at the beginning of this article), or ‘The American approach to competence’ (Evangelista 2006a, 2008) because has been developed in the US by McClelland (1973), Boyatzis (1982) and others. The human factors by which competence depends can be assessed by different means depending on their nature: personality tests, attitudes tests, oral or written tests (for technical and general knowledge), interviews focused on personal skills such as the BEI Behavioral Event Interview developed by McClelland (on BEI see Evangelista 2008). • the personal attributes are called competencies, so it comes out competence depends on competencies. Similar words (competence, competency, competencies) are used to mean different elements, so many misunderstandings arise (Evangelista 2008). • The second, most important pitfall is this too is an indirect method. 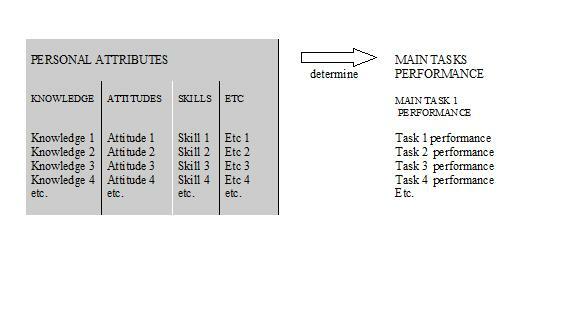 The relationship between personal attributes and performance in main tasks is indirect, that is to say speculative. The real reasoning so is the following: ‘If you are precise, well organized, emphatic, ………. than you will PROBABLY perform well the main task(s) on which you are seeking accreditation’. The competencies based approach is useful when is not possible (for example in recruiting or in career guidance) to observe directly the person carrying out a job; when instead dealing with assessing competence of people at work, as in accrediting people delivering career guidance, then performance based approaches are more precise. Differences between the two approaches (and superiority of the latter) are clarified also by the possible questions in an assessment interview. An interview carried out with the competencies based approach will use questions such as: : ‘What motivate you in work?’, ‘What do you think are your strong and weak points?’, ‘How do you deal with stress?’, ‘ Describe the worst project you worked on’, ‘Describe a time you had to work with someone you didn’t like’, ‘Describe a successful outcome you accomplished working in a team’ and so on. (Evangelista 2008). An interview carried out following the performance based approach (aimed for example at assessing competence to carry out a career guidance interview) will use questions such as. ‘Which are the main steps of your interviews? In an interview, how do you explain privacy arrangements / signal time is limited? What are the main challenges in managing an interview? How do you address them?’. 6. Main dilemma 4: how to spread the framework? We need a European framework, but the European Commission has not the power to impose occupational profiles or frameworks to Member States. So it should be a voluntary framework diffuse through a bottom-up process. Who could fuel it? In the last years several networks for research and discussion on career guidance have been promoted by the Commission (for example the Expert Group on Career Guidance by the European Commission, the Career Guidance Virtual Community by Cedefop, some National Fora), but surprisingly so far national career guidance practitioners associations have been ignored. In National Fora most participants are generic training or research organizations and not career guidance practitioners organizations. Most European practitioners associations are currently member of IAEVG, but so far in my opinion IAEVG has not worked enough in a European perspective. To spread a European framework to accredit practitioners we need the direct involvement of European practitioners associations (hence the title of this paper, note 7). A European Federation should be promoted. 2. to create possibilities for discussion and reciprocal acquaintance between national associations so they can establish a European Federation. Several measures can be adopted to foster this, but for brevity are not discussed here. An important point to be considered is the tradeoff between reliability of the assessment and cumbersomeness of the assessment process. Very in brief, in 2006 the European Commission proposed to the Parliament the approval (in 2007) of a Directive on a European Qualification Framework (note 8). Its implementation by EU Member States will be voluntarily. The aim of EQF is to allow comparison of existing qualifications across differing national education and training systems. EQF doesn’t provide any system for recognizing not formal learning nor awards qualifications (note 10). In the field of accreditation of non-formal and informal learning the Council of the EU has so far produced only a list of very general (useless) principles in 2004 (Evangelista 2006d). EQF consists of a list of eight levels. For each level a description of the corresponding level of knowledge, skills and responsibility and autonomy is provided. See for example how the first three levels are structured. Each national existing educational and vocational qualification is going to be related with a specific level of the EQF, so to allow comparison. 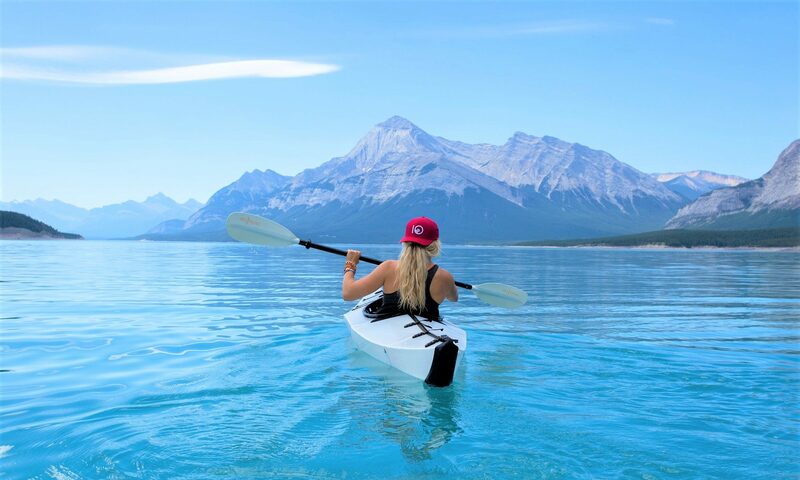 In other words, a person holding a national vocational qualification of let say level 4 in a specific field can work or study in all the other European countries where the requested national qualification in that field is a level 4 qualification. 3. in EQF a specific level of knowledge is always related with a specific level of skills and of responsibility and autonomy. This too cannot be accepted. Knowledge, skills and responsibility and autonomy can be combined in each person in many different ways. 9. How well a European framework can facilitate mobility of career guidance practitioners between different European countries? Frameworks based on educational or vocational qualifications require to develop tools for portability or equivalence of the qualifications. This can result cumbersome or imprecise. On the contrary a European framework based on main tasks seems to allow each career guidance person, once accredited, to work immediately in every European country. This is not exact. A career guidance practitioner let say from Italy doesn’t have the knowledge of the educational systems, labour market, occupations, job search of the other countries, nor where to find them, so it cannot immediately work in a different country. This case, a convenient period of learning and work under he supervision of a local practitioner has to b required. 1. I have discussed in deep these issues with my Colleagues of the Leonardo da Vinci Project EAS European Accreditation Scheme for Career Guidance Counsellors IT/06/C/F/TH-81406 By the way this article is based on my personal opinions and do not involves in any way my Colleagues or the Project development. 2. I personally prefer ‘career support’ (Kidd 2006) to ‘career guidance’, but I will use the latter. 4. In my experience a career guidance interview can be followed by: A. an availability of the practitioner to meet or to answer by telephone or email to further questions if needed by the client B. periodic further meetings to support the client while is implementing his/her action plan (for example a meeting every fortnight to review a job search). In this case the support given by the practitioner is mostly informational and psychological in nature, and doesn’t imply carrying out a job search on behalf of the client. It can be carried out on 1:1 or in a small group base C. periodic further meetings to support the client while is implementing his/her action plan PLUS continuous contacts with educational authorities or employers on behalf of or to advocate the client with educational authorities or potential employers. Case A happens with about 70% of clients. Case B. can be called ‘follow up’ and defined as: direct support to clients while implementing their action plan. Case C. can be called ‘mediation’ and defined as direct support to clients while implementing their action plan plus advocating the client with educational authorities or potential employers. The contacts with potential employers can also start before meeting the client (the practitioner contacts potential employers looking for job openings for future clients) and include a matching between the clients in charge and the retrieved job offers. B and C are necessary when working with clients of medium or low employability, and form the ‘take in charge’ area. To me, mediation is a main tasks, while A and B are not prominent and so are part of the ‘Perform career guidance interviews’ main task. 6. The idea for this table was given me by Sasa Niklanovic. 8. European Commission 2006a. For an appraisal see, in Italian, Evangelista 2006c. CEDEFOP (2007) AO/B/RLAR/Guidance-Qualifications/005/07 A study on qualifications routes and competencies needed by career guidance counsellors, 19-6-2007. European Commission (2006b) MEMO/06/318 (dated 5 September 2006), retrieved at http://europa.eu/rapid/pressReleasesAction.do?reference=MEMO/06/318&format=DOC&aged=1&language=EN&guiLanguage=fr on the 12nd April 2007. 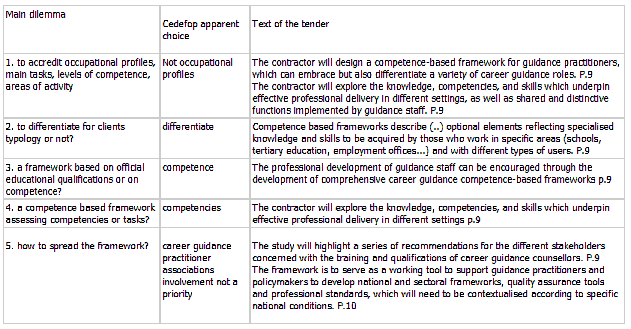 Evangelista (2006a) Competencies and Career Guidance. Evangelista L. (2006b) La normativa europea sulle professioni regolamentate. Evangelista L. (2006c) Il Quadro Europeo delle Qualifiche (European Qualification Framework EQF). Evangelista L. (2008) The quest for competence. Evangelista L. (2011) A description and an appraisal of EVGP Educational and Vocational Guidance Practitioner. McClelland, D. C. (1973) Testing for competence rather than for “intelligence.” American Psychologist, 28, 1-14. Offer M, (2001) The Discourse of the Labour Market. in Gothard B., Mignot P., Offer M., Ruff M., Careers Guidance in Context, SAGE Publications. Author: Leonardo Evangelista www.leonardoevangelista.it © Leonardo Evangelista. First placed in this website on the 15th of September 2007. Version of the 4th of October 2008. This article can be reproduced quoting Author’s name and article’s URL.